Volunteers are central to the work of countless charities and other voluntary and community organisations. They are a valuable presence in many communities, making a difference in places as diverse as sports clubs, libraries, schools, hospitals and residential areas. 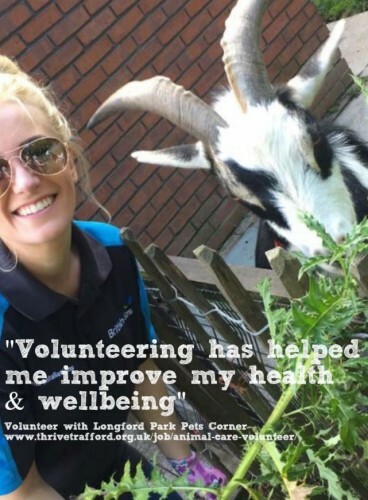 Events, and activities will be taking place across the country to mark Volunteers’ Week. The annual campaign, which was established in 1984, recognises the contribution volunteers make to our communities every day. Charities across the UK will hold events and activities to thank their volunteers and celebrate the power of volunteering to bring communities together. Last year more than 900 events took place, from awards ceremonies to tea parties and barbecues. For many charities the week will also be a chance to showcase the range of volunteering opportunities on offer which is what Thrive will be doing throughout the week via social media and on the Thrive Trafford website. Thrive Trafford will also be sharing different information around Volunteering and the benefits it can bring to the volunteers, charities, local communities and people getting supported. Along with showcasing some of the different volunteering opportunities available for people to get involved with in their local community in Trafford. For further ideas for celebrating Volunteers and Volunteers Week download the Volunteers Week Resource Pack. In 2012-13 volunteering output contributed an estimated £23.9billion to the UK economy. This is equivalent to over 1.5% of GDP. 21.6 million (42%) people in the UK volunteer formally at least once a year and 13.8 million (27%) of people do so at least once a month. There are 162,965 voluntary organisations in the UK, many of whom rely on volunteers. Lots of volunteering also takes place within the public and private sector. For example, there are an estimated 3 million people volunteering in health and care.